Small businesses often fail because owners are unaware of the many elements that can prevent the business from growing and being successful. Often, small businesses are organized around the manager's specific area of expertise, such as marketing, accounting or production. This specialized expertise often prevents the business owner from recognizing problems that may arise in other parts of the business. This guide will provide you, the small business entrepreneur, with the essentials for conducting a comprehensive search for existing or potential problems in your Bookkeeping and Accounting. This guide was designed with small businesses in mind and addresses their unique problems and opportunities. In order to gain maximum effectiveness from this guide, you should answer all questions in the audit, with an affirmative answer indicating no problem and a negative answer indicating the presence of a problem in a specific area. After completing answering the preliminary questions, you can proceed to review the analysis of each section of the audit that follows to determine what action is most appropriate. The audit analysis provides an overview of how the various elements of the audit are related. 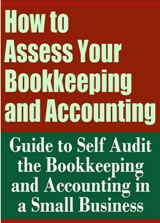 This audit covers the critical function of the Bookkeeping and Accounting in a small business..
A. The company has a bookkeeping system. a. Understands the how and why. b. Prepares own financial statements. 2. Pays for bookkeeping service. b. Has taxes done by bookkeeper. c. Has compared cost for bookkeeper with that of a CPA. B. The company reconciles bank statements monthly. C. The company keeps income and expense statements accurate and prepares statements monthly. 1. Understands purpose of financial statements. 2. Compares several monthly statements for trends. 3. Compares statements against industry averages. 4. Knows current financial status of business. D. The company makes monthly deposits for taxes. 1. Makes deposits on time to avoid penalties. E. The company has a credit policy. 1. Ages billing system monthly. 2. Accesses late payment fee from customers. 3. Writes off bad debts. 4. Has good collection policies. 5. Has a series of increasingly pointed letters to collect from late customers. 6. Has VISA, MasterCard, or other credit card system. F. The owner considers tax implications. 1. Considers buy versus lease possibilities. 2. Considers possible advantages/disadvantages of incorporation. 4. Does not pay tax penalties. A. The company has a single- or double-entry bookkeeping system. Record keeping is vital to the survival and success of any business. According to analysis of the cases studied, problems with record keeping constituted the second-largest problem area. Whether the business used a single- or double-entry system did not appear to be as important as how the system was executed. Timely and accurate record keeping is essential. 1. The owner prepares the books. The small business owner who understands bookkeeping, records the transactions and prepares the financial statements has an intimate knowledge of the business. Knowledge of these accounting and financial aspects makes the owner credible with lending institutions. It also keeps the owner out of financial trouble and helps him or her stay focused on ways to make a profit. 2. The owner pays for bookkeeping service. The owner who does not understand the essentials of bookkeeping needs to hire a trusted professional. Even then, the owner needs to understand financial statements. Failure to understand essential financial statements is an indication that the owner has surrendered managerial responsibility. It is generally wise to have the professional bookkeeping service prepare taxes when the service is already keeping the books. The owner who does not do the record keeping is rarely in close enough touch with the records to adequately prepare tax forms. The business owner who delegates so much financial responsibility to others should think seriously about using a CPA. B. The owner reconciles bank statements monthly. A quick way to get into financial trouble is not to reconcile bank statements monthly. With a single-entry bookkeeping system, this is the only way to maintain accuracy. Even when a doubleentry system is used, reconciling statements monthly is the only sure way to catch mistakes. Too many small business owners put this off because of other, more pressing, concerns. This destroys the validity of their own financial statements, causing them to make important decisions based on erroneous data. C. The owner keeps income and expense statements accurate and prepares statements monthly. The ability to track the flow of funds into and out of the business is necessary for continued viability. Cash flow problems have closed many small businesses. The monthly preparation of accurate income and expense statements is the best single way to avert critical cash shortages. 1. The owner understands purpose of financial statements. An owner who understands that financial statements are essential for directing and controlling a business will more likely take them seriously. Well-prepared business statements put the owner in control of the business, facilitate relationships with lending institutions and simplify tax preparation, often saving the owner tax dollars. 2. The owner compares several monthly statements for trends. Comparing monthly and annual statements for trends provides financial data for planning purposes. Trend analysis is essential for efficient inventory control, capital budgeting, vacation scheduling, timely advertising, promotional campaigns and profit maximization. 3. The owner compares statements against industrial averages. Knowing how a business compares financially to others helps the owner who is seeking loans or expansion opportunities. Such knowledge also provides the owner with both a psychological and planning advantage, adds to the owner's awareness of how well the industry is doing as a whole and provides an early warning system for market fluctuations and trends.